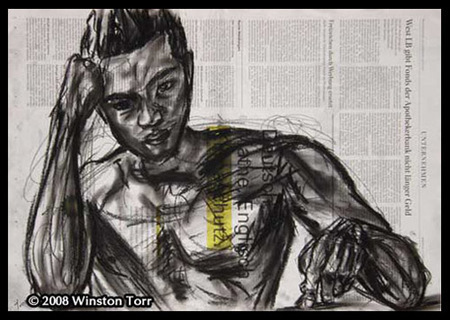 Pretty On The Outside: Winston Torr's charcoal drawings. My body of work deals with the human figure and puts it in relationship with the daily news of a globalized world, utilizing newspapers of various languages that reference my cultural and racial background and the places that I live in and travel to. By literally making the drawings part of the page, the three-dimensional figures of charcoal and pigment start a dialogue with the mostly two-dimensional space of news items on the page. A dialogue that is both graphical and psychological as my personal and at times intimate experience of drawing the figures becomes part of the news: my news. Furthermore, the date on every newspaper page places my creative interaction with the depicted person in time and etches it into my personal history. The technical rawness I like to keep in these pieces are a direct translation of my psychological experience in a day-in-day-out society. The month of November, he's doing a self portrait a day which will eventually end up as a coffee table book. 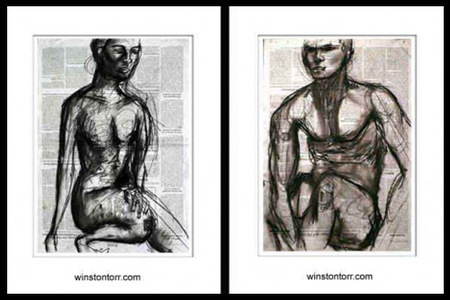 Check out Winston's blog to see further drawings. Above is one of his self portraits. 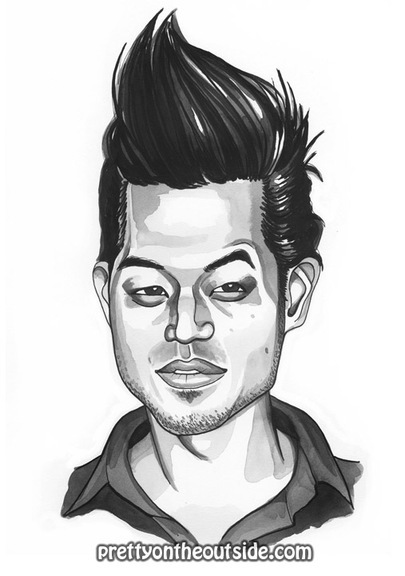 Since I found his site about a week ago, I've checked back everyday to see his latest portrait entry. I definitely appreciate the energy and confidence of his charcoal work. I couldn't resist doing my own drawing of him. My portrait of Winston was done with pen and ink on 9" x 12" Watercolor paper. If you're wondering what one of Winston's self portraits sessions look like--- well, in the second part of this posting you'll get a peak. It's unfortunate to have to put an NSFW warning here, but if you're at work or opposed to seeing a handsome naked man drawing, well that's too bad. What a cool artist! Thanks for introducing him! Watching his video was pretty interesting as well. Wow what energy. I found this oddly inspiring! I am so excited to see a feature on my good friend Winston. He's been a very important part of my life for 11 years now, and come so far as a talented and gifted artist. He inspires me. I love the portrait you did of me... really really love your work! you are amazing! I just subscribed to you feed, and will be reading your entry's... can't wait for more! All I can say is WOW! What an absolutely beautiful man and gifted artist. Have to say, though, you're still my personal fav! Awesome video and I love the portrait that you did of winston. It looks like charcoal to me, very smooth! I like the banner also, was that done in charcoal?